A strange e-mail in my inbox as NYCC is getting underway. 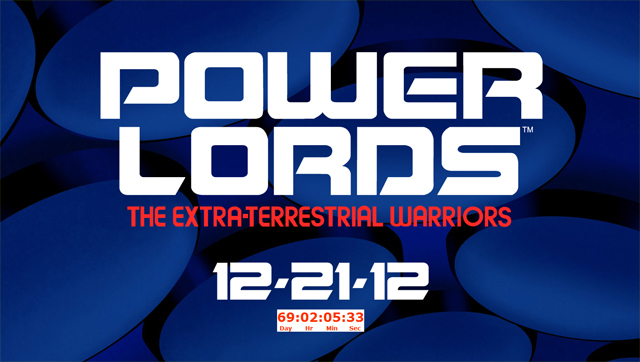 The sender, identifying himself only as “Adam Power”, passed along a link to a placeholder site that displays the classic Power Lords: The Extra-Terrestrial Warriors logo and a date that is to end the world as we know it: 12-21-12. I never had a Power Lords figure, but the line was seared into my brain courtesy of an ad that appeared on the back cover of like, every comic book ever when I was a kid. I was always justifiably intrigued, but yet, nary a Power Lords figure entered into my childhood collection. A few years ago, when that chance memory of a guy turning blue on the back of a comic book came up, I looked into Power Lords. It’s a toy line that fits snugly in the 80s. Adam Power is charged with protecting a powerful cosmic jewel from the galaxy-conquering alien Arkus. Toss in some comrades, henchmen, a few vehicles, and the hallmark of a good 80s line, a playset and the line was good to go. While it’s Adam Power and his strange blue backside that has kept Power Lords with me all these years, it turns out the aliens were pretty sweet too. Revell contracted their design out to the legendary Wayne Barlowe, author of Barlowe’s Guide to Extraterrestrials (affiliate link). Scroll down towards the bottom of this page at Wayne Barlow’s personal site for some amazing original Power Lords artwork. If you’re in the mood for a stroll down mystery lane, I haven’t run across a specific fansite devoted to Power Lords, but the ever-reliable FigureRealm.com has a near complete gallery of the classic line including the basic figures, the strange half-tank Beast Machines, and the Vulcan Rock playset. …if the world doesn’t end. Who’s excited about the return of the Power Lords? This guy!!! I’m sure a lot of people thought the world would end before Power Lords made a come back. And considering the date shown on the website, it’s looks like they’ll just squeeze in there before that supposedly happens. I’m so friggin jacked about this announcement!!! It’s certainly among the last brands I expected to return, that’s for sure! I remember these guys well although I didn’t collect ’em either. I thought it was odd that Revell (better known for their model kits) were behind the line. But then again, nearly every toy company tried their hand at the action figure market during the decade spanning the late 70’s through late 80’s. It should be interesting to see whether these are reissues or updated versions of the vintage stuff. Power Lords Classics anyone? It may well be Round 2, the company that owns the current revived model kit companies AMT, MPC and Polar Lights (one of several companies that wished to carry on the legacy of Aurora). I believe it’s R2 that’s currently behind the current Captain Action revival. Or the guy is just throwing that out there to see how many eyeballs he gets so he can take it to someone and how how HOT HOT HOT his property is. I don’t think my writing style is anything like yours, but if I ever wrote an article about Power Lords, I’m pretty sure that exact sentence would appear in it. I don’t recall even hearing about Power Lords until the late 1990s, when I got a couple books about sci-fi properties and toys of the 1980s. Never saw a picture of them until recently. Very cool. If they do them in 4″-scale, I’d definitely consider adding them to The Collection. With today’s toy technology, I would hope they’d do Adam Power as a colour-change figure. Now we need some Crystar to go along with these guys. Very cool news. I’ve come VERY close to pulling the trigger on vintage Power Lords figures on several occasions, but never did. In theory I’d hope to see the 4H take a crack, considering Treadaway’s such a big fan. But I’m anxious and almost definitely game for whatever comes down the pike! First off, I am completely miffed I didn’t get this email too. Second, a quick trademark search reveals that Ned Strongin, the man who developed the original Power Lords toy line along with his partner Len Mayem and artist Wayne Barlow, applied for the Power Lords trademark for “Collectable toy figures; Play sets for action figures; Toy action figures and accessories” in May 2012. So however these are getting made, Mr. Strogin is clearly involved in some way. Power Lords coming back is great news!! I just hope they’re compatible with existing figures and not a wonked out scale. Well he better bring that awesome playset back with him too! WOW…Thats kinda of cool..Believe it are not i still have the Vulcan Rock playset,it’s has a few broke pieces here and there..mainly the elevator. I’ve been using it every now and then as a villain’s HQ. Can’t wait to see how they will tackle the Power Lords toy line this time around….Now all we need is M.A.S.K. to make a come back 🙂 !!! Good Heavens! THIS is a Blast From The Past I never saw coming! I’m a casual fan (I “inherited” my sister’s entire Power Lords Collection a while back), but they’re really obscure, aren’t they? What next–? An “Upsy/Downsy” Revival??? 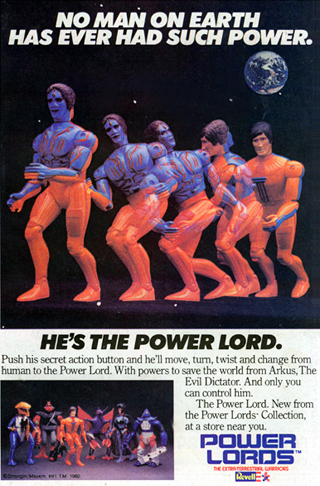 I’m not even sure I remember Power Lords — I think like you, I saw ads for them in comics/magazines but that was about it. I had a few of the Power Lords back in the day. I have to say, they really are some of the creepiest, most unattractive characters ever. With the cost of making action figures nowadays, i’m more than a little surprised to hear that someone’s actually going to try and bring back a line of toys that never really set the world on fire, and only lasted one “wave.” But to each his own, and good luck, I guess. Maybe they’ll turn out awesome this time around. Totally didn’t know there was a second wave. I don’t think I ever saw them in any store. Thanks for the info, I’m gonna have to track down some images of these guys. Even when I was a little kid I had trouble suspending disbelief with this line. The dude has a whole face and body on his back! And look at all those thumbs! How can the other toys not see that? If they try to update the gimmick hopefully they do better than MOTUC King Hsss’s transformation. I never had a toys but remember the ads too. Should be interesting to see what the new versions will look like.